Despite my comprehensive education at the local comprehensive, I did not know that Yoxford landmark Satis House takes its name from Great Expectations. I don't doubt that the Latin scholars among us would know that "satis" means "enough", as in enough of my yakkin'. Past San Souci on the right, past Satis House on the left and follow that give-us-a-sign pointing right to Westleton. Half a mile later, right again, not into Prime Irrigation (love that name) but the Emmerdale Farm Shop. I know, Emmerdale in Suffolk, eh? 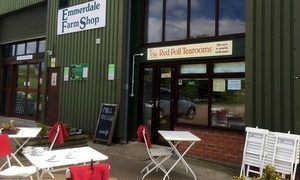 They've got the holy trinity of butchery, farm market and, for us, the Red Poll Tearooms. Always a warm welcome, reads the sign, and you have to admire the lack of an exclamation mark. Nicely played. Stacks o' seating inside including a sofa upstairs. Sun's out, though, so we'll grab an outside table with attached blanket per chair, another quality touch. Hoorah for hygge. Many menu options but that'll be a breakfast bap for Andy and a self-assembly BLT for me with bacon worthy of John Hutton. Seemingly all possible San Pellegrino flavours available, too, and bonus points for the gamut of tourist information leaflets. Apparently no discount for bringing in your own plates, sadly. Family-run business and it seemed that we met most of them that single lunchtime, every single one most welcoming, like the sign said. Given that we were at the very limits of our lunchtime range, didn't really have the time for coffee and cake but seemed rude not to. Very good Bury St Edmunds originating coffee with a satisfying slab of Victoria sponge. Super savoury and sweet and a soupcon of sun. If it was a car -- John Deere Gator HPX. If they were passing by -- Adam Henson.